Of all Argentinian genre of music by far the best known world wide are the Tango and Folklore. 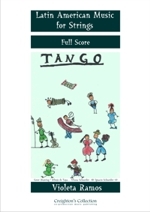 This piece is arranged to enable students to play the tango easily but it is not a strictly traditional tango because it has sections of Folklore rhythms which give the music a wonderfully cheerful tone. For students of varying in ability from intermediate to advanced level.